Quality, Health, Safety and Environment (QHSE) are four components of a responsible corporate management approach based on the belief that all accidents are caused by human error and are, therefore, preventable. The QHSE Team in BOG helps to promote an incidence-free work environment. Last year, BOG obtained the 1SO 9001:2015 Quality Management System (QMS) certification to replace existing ISO 9001:2008. This year, to take our quality management system higher, we are in the process of implementing ISO 45001:2018 and ISO 14001:2015 for Occupational Health and Safety (OH & S) Management System and Environmental Management System respectively. It is geared towards protecting the health and safety of workers and other interested parties, and to protect the environment. The two standards – ISO 45001:2018 and ISO 14001:2015 have been introduced company-wide and documentation is ongoing. Through the involvement of top management, clear communication, effective processes for identifying hazards, and the means for continual improvement, ISO 45001:2018 sets forth the guidance for BOG to improve its OH & S performance. With its usage, BOG has been able to clearly identify its organizational health and safety risks, evaluate and seek to improve performance, and encourage and assure that workers play an active role. Ultimately, implementing these two standards can better the reputation of BOG to gain more customers’ trust and advance a positive staff morale. 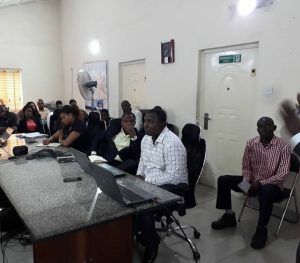 Cross-section of staff during a session where the standards were being introduced in Port Harcourt.